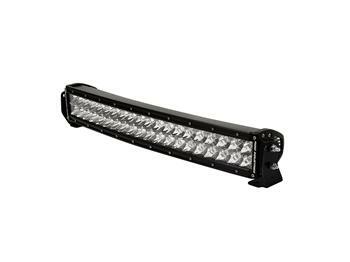 Rigid Light Bar - RDS Series UNIVERSAL - Dezod Motorsports Inc - Home of the automotive performance enthusiast since 2002. Rigid Industries RDS-Series was the first for the LED lighting industry and has been in testing and pre-production for the last two years and was first tested by BJ Baldwin as seen on his trophy truck at Parker 300 in January 2012. Since that time, Rigid Industries’ engineering team has been through numerous tweeks, incorporating multiple patent pending utility and design features. The RDS LED light bar transforms the rectangular light bar Rigid Industries debuted as a phenomenon in 2006, to give this futuristic design sleekness and offer its customers an increased light spread. The world is curved, match it. Recently in June 2014, Bryce Menzies won the Baja 500 with their trophy truck featuring the new and improved Rigid Industries RDS-Series LED Light Bar!